The Super Bowl ads have made commercial history for 50 years. A review of best remembered ones reminded me of the petite grandmother-type viewing her fast food hamburger with disdain and uttering these words, “Where’s the beef?” How might this question relate to writing? The best questions to ask yourself at any point in your “product’s” process is the following: Are my characters’ behaviours, beliefs, backstories, and personalities substantive enough (ie. beefy) to hold my readers’ attentions? Relatable, that’s the goal: villains, heroes, and support characters alike. I struggle with a main character whom I have not integrated in my own mind. Guess what? She doesn’t come alive in print because I don’t relate to her as much as other people in my novel. Unfortunately, she won’t come to life until I write more about her personality and style of living and thinking—whether I include those efforts in the book or not. Otherwise, she will never captivate my readers because she hasn’t captivated me. I have work to do, You? Oh’ these things that make us stronger! LOL! Thank you, Chris! My friend Candy over @ Come and Rest Awhile always has the best posts! 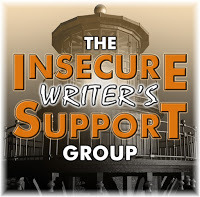 I have joined a new group, yes, another, but this time, listen to their name … Insecure Writers Support Group … the IWSG now these peeps have got it going on. This everlasting quest of mine to become better, to write clearer, to bring my stories to life, has brought me to toil away long hours and as such I can say I am over advice from other, would be, wannabes. (well maybe not everyone) While I have gluttonously devoured as many words and articles as I have caffeine and crumb cake, now, I lay back numb. Unless you can offer up your degree on semantics, literature or your bank statement with quarterly infusions of royalties, I must digress. I do this for sanity, because as I see you, I am in truth looking back at me, but this ego of yours has gotten in the way. Okay, fellow writers— We’ve all heard the caveats: “show don’t tell,” “use backstory ONLY when it advances the plot,” and “episodic storytelling is deadly for a reader without relating those events to the basic conflict” Man, these “rules” baffle many writers. Don’t stories/novels move from point a to point b rooted in time/ place? Actually, no. That’s not enough to provide for and maintain riveted readers,. The “drop the ball” issue is about pacing. Pacing is paramount to a reader’s satisfaction. If the heroine moves from one drama to the next without the events advancing the core conflict, the reader becomes bored. What is the transformation for the character? Transformation is not evident if the plot is episodic and does not pull the reader into the tension that relates to the main conflict. As Larry Brooks delineates in several books including Story Physics – Harnessing the Underlying Forces of Storytelling, writers must meld dramatic tension throughout the entire book.” Without the common thread between character, events, storyline and the conflict that pulls the story along is a strike (or two) against us writers. Wholeheartedly I recommend any of his books on writing.